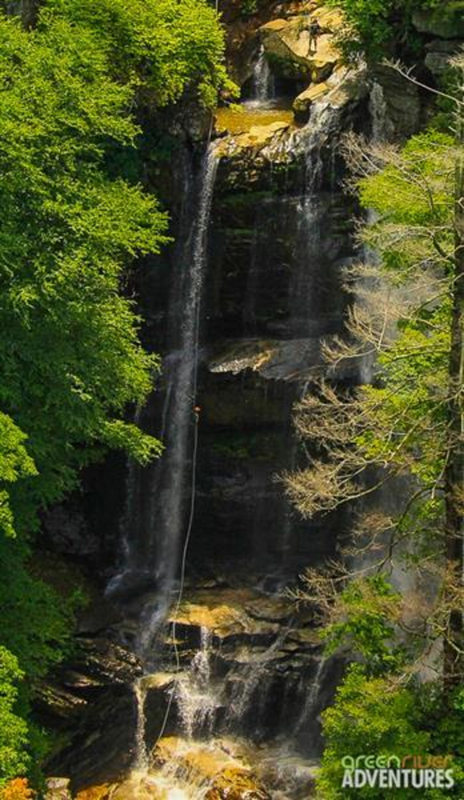 A refreshing rappel, under the careful guidance of Green River Adventures, down 200' Bradley Falls! Everything has been doubled back, double checked, your gear is top-notch and your anchor is solid. You take a deep, yet fluttering breath, firmly grasp the rope and eye the bottom of Bradley Falls, 200’ below. Time slows, your senses sharpen and as you lean back everything in your body, except for your sense of adventure, is screaming for you to stop! 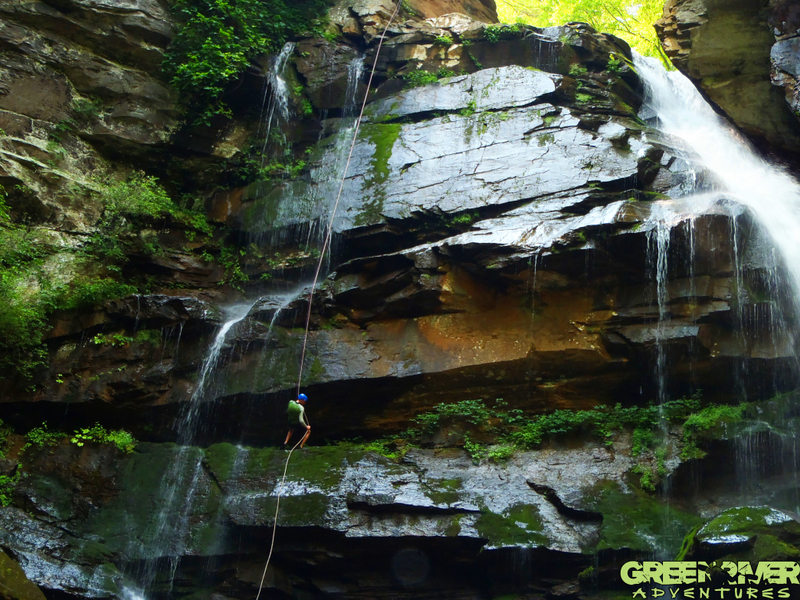 You go for it anyways and before you know it you’re in the midst of a cool cascade of Appalachian water on an epic rappel down Bradley Falls in The Green River Gorge! 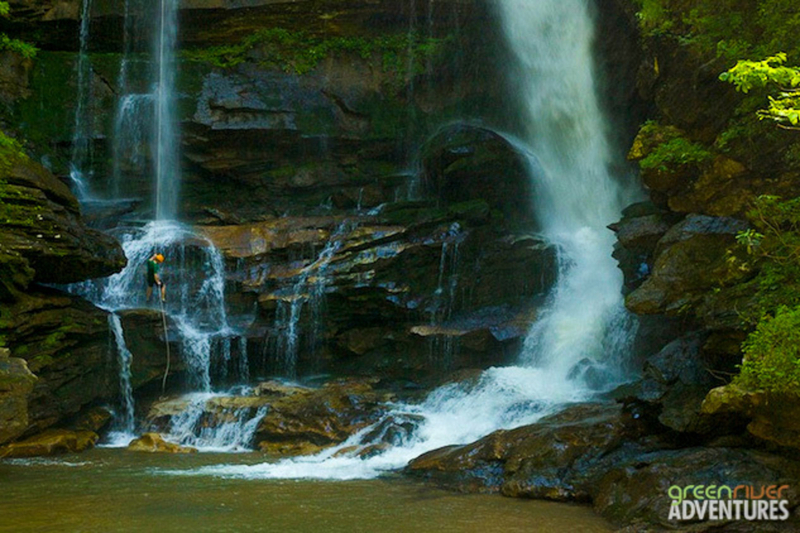 Imagine yourself descending slowly beside the plummeting waters of Bradley falls on a rappelling adventure for the ages! The weather is warm and you’re enjoying the refreshing nature of the perpetually cool Appalachian waters. As you adventurously make your way towards the base of the falls the chemicals in your body are screaming for joy and you are “so happy you did this.” Midway through the rope you thank yourself for being the adventurous type and vow to record this magnificent moment to memory. If you have never experienced the joy of rappelling, you should, and there’s no better place to embark on a downwardly vertical journey than under the careful guidance of Green River Adventure’s highly trained staff. Even if you’re a seasoned crag crusher and used to “rapping” this unique waterfall adventure is still for you! Thanks to careful guidance of the AMGA certified facilitators no experience is necessary on this epic adventure. Green River Adventures has developed a progression that eases beginners into the activity and gives veterans a chance to review their skills before taking the plunge. At “Ground School” instructors will orient you to your harness and gear and teach you the techniques of rappelling on a gentle slope. 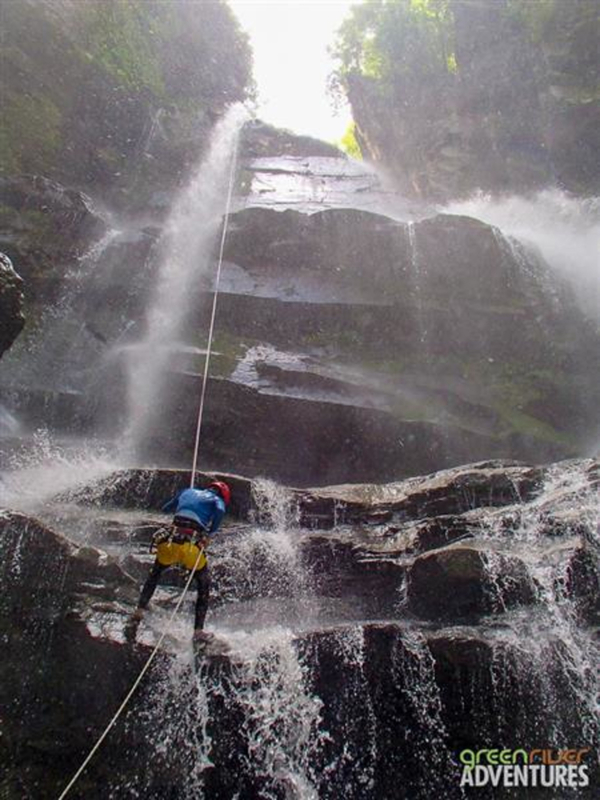 When you’ve mastered your rappel device, and tested your courage on a 30’ vertical practice wall you will be ready to descend the 200 ft Waterfall Rappel! Trips begin from Green River Adventures main office. This waterfall adventure runs for 4 hours at a cost of $100. Green River Adventures also offers a full day canyoneering trip which includes a guided trek and lunch as well as the waterfall rappel for $150. The trips run rain or shine at 9:00am and reservations are required. Water, a light snack, and all equipment including helmets and harness are provided. Come prepared to get wet and to have a great time!